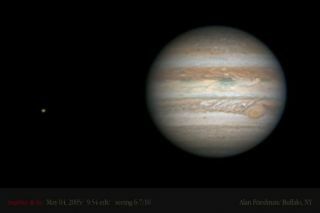 The planet Jupiter imaged by Alan Friedman. At some point, all who develop a love for astronomy surrender to temptation and try to capture the beauty of the night sky through photography. Some are inspired by the glorious pictures (many taken by amateurs) featured in magazines and on the Internet. Others look to record data for their own amateur scientific research. And some hope simply to share the glorious beauty experienced in the solitary hours of night with loved ones who find this time of day better suited to sleeping. There has never been a better time to give astrophotography a go. Cameras are more powerful and less expensive than ever before. Getting started, though, can be somewhat daunting. A little self-evaluation of your interests, location, time and budget is a good idea and may help avoid frustration. Taking pictures in the dark of stuff that is a long way away can be the most rewarding and the most infuriating hobby under the sun. I've tried a lot of stuff. After testing the waters with a cooled CCD camera, film and digital SLRs, I've settled into a photography set-up that is better suited for my life and location. I live in the middle of a moderately large city by the Great Lakes with frequent clouds and bright urban skies that show three stars in the little dipper on a good night. I have young kids and a very full calendar that leaves limited opportunity to travel to a dark sky location. I own some very nice equipment - but it must be put away after each observing session. Rarely do I have the time to do the dead nuts polar alignment needed for long exposure deep sky photography. A few years back I ordered a color webcam to try my hand at planetary imaging. The tiny camera was cheap (under $100 at the time), light, simple to set-up and allowed me to focus an image in real time on my laptop computer screen. Best of all, it was proving itself to be the tool of choice for the objects visible without compromise from my city backyard - the moon, the sun and the planets. Consumer webcams like my Phillips ToUcam are still around and in use today - but more powerful tools have emerged. Scientific and industrial camera models made by The Imaging Source, Point Gray Research and Lumenera are more sensitive, less noisy and utilize high speed data transmission to produce better images than consumer versions. These cameras can now be operated from programs dedicated to astronomy and can be run at the long exposures needed for deep sky objects. Most cost $300 and up depending on chip size and features. Companies like Orion Telescopes & Binoculars have branded their own cameras designed for astronomy with similar capabilities. 2007 brings a calendar full of opportunities and special events to record. Saturn still rides high for mid-northern observers and Mars will return. Jupiter will be a low and difficult target but the sun and moon beckon with a constantly changing show. Stay tuned - in future articles I will share some tools and techniques you can use to capture detailed portraits of these magnificent celestial neighbors. Editor's Note : Comet McNaught (2006/P1) is rapidily evolving into a very bright comet and could become one of the great comets of the 21st century. Bright comets present an excellent opportunity for astrophotography using 35mm film cameras or consumer digital cameras.